The Ekiti government yesterday again failed to halt the probe of its finances by anti-graft agencies. The High Court sitting in Ado Ekiti refused the ex-parte motion brought by it to stop the Economic and Financial Crimes Commission (EFCC), the Independent Corrupt Practices and other related Offences Commission (ICPC), Department of State Services (DSS), Commissioner for Finance, Accountant General and five banks with the state’s finances. The plaintiffs included the Speaker of the House of Assembly, the Attorney General and Commissioner for Justice, Mr. Owoseeni Ajayi and Ahmed Raji (SAN). They had earlier filed the application, seeking to halt the impending probe of the state’s accounts by the EFCC and ICPC. Another relief sought by the plaintiffs was an order stopping the arrest of the Commissioner for Finance, Accountant General and managers of the affected banks. 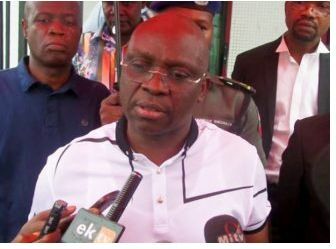 During the probe of some accounts belonging to Governor Ayodele Fayose in some banks allegedly containing N1.299 billion received from the office of former National Security Adviser, Sambo Dasuki, the EFCC had accused him of taking kickbacks from some contractors handling major projects in the state. The anti-graft agency also accused the governor of using the proceeds to purchase multi-million assets in Lagos and Abuja. On that premise, EFCC mulled comprehensive investigations into the financial transactions of his government. When the matter was mentioned on August 16 this year, the Attorney General and Commissioner for Justice brought the ex parte motion to restrain the anti-graft agencies from arresting and/or detaining any accounting officers of the state for the purposes of carrying out the impending probe.